Peace and Tranquillity is the perfect name for this calm retreat. 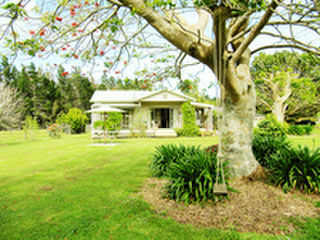 Go out and about, exploring the Bay of Islands, and come back to a little piece of heaven every afternoon. Or spend whole days here, relaxing in the park-like gardens, rowing on the lake, or visiting the farm animals. Dogs are allowed in the house, but not on beds or furniture.